D iscover the circuits in and around our vineyards. These circuits are educational, fun for all the family, and user-friendly. By learning about the principal grape varieties of the Bordeaux region you will share in the experience of our winegrowers. The different grape varieties of the Bordeaux vineyards will have no secrets for you. Each one has its particularities that are explained to you on our visitor posters. Semillon is the grape that allows us to produce our sweet white wines. The name of the Sauvignon variety, whose leaves resemble those of wild-growing vines, comes from this resemblance (‘sauvage’ means wild). Muscadelle, which can also be found in our delicious wines, is a fragile variety that requires lots of care. Discover the Cabernet Sauvignon variety, the red variety that is considered to be the king of the Bordeaux vineyards. As for Cabernet Franc, this is a robust variety which apparently originates from Spain and was brought into France by pilgrims returning from Santiago de Compostela. Last but not least is the dominant variety in the Bordeaux vineyards, Merlot, whose name comes from ‘merle’, the French word for blackbird. 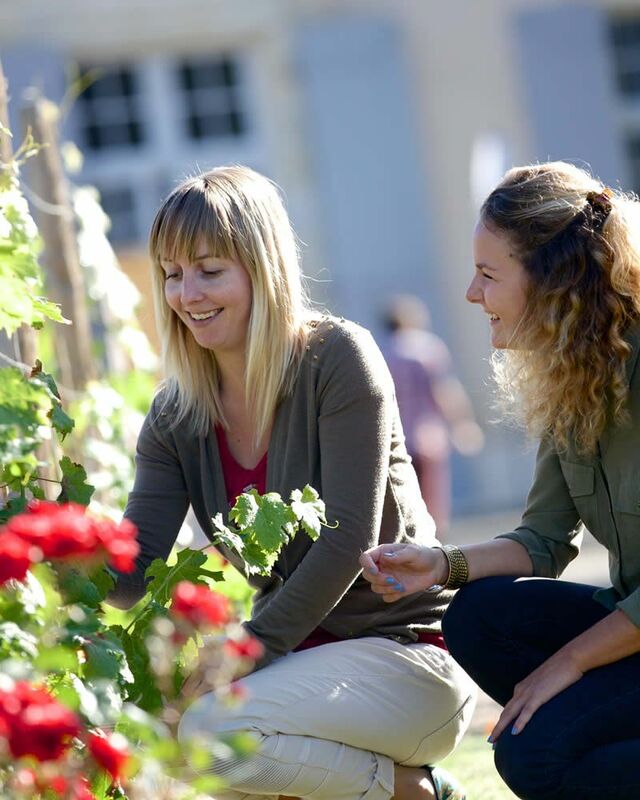 There is a visit that is complementary to your museum visit : thanks to the plantations outside the Maison des Vins in the tree-lined gardens, you will follow the evolution of the vines and understand in a fun way what the winegrower’s work is all about. Find the clues and discover the answers to the questions on vines and their life-cycle in order to become a real expert. This activity is accessible to all, come and have fun with your family or with friends.